Have you ever wondered who is in charge of making wishes come true? Magic isn’t infinite, after all, and it can’t be used to fix everything. Will is an easy guy to like. His empathy for other people reveals itself fairly quickly, but what I really appreciated about him is what a well-rounded character he is. He has realistic strengths and weaknesses that interact with the plot in ways that I often didn’t see coming ahead of time. I had a good time getting to know him, and I’d be interested in reading more stories about him in the future. There were a few pacing issues in the beginning that threatened to distract me from the plot. A surprising amount of time was spent describing Will’s family and school. I enjoyed seeing what his daily life was like before he received this peculiar assignment, but this tale would have easily earned a much higher rating if some of that exposition had happened within more action-packed chapters. Eventually I did get drawn into Will’s world, but the slow beginning was a bit of deterrent for me at first. I had an inkling that this book might be funny, but I wasn’t expecting to enjoy its zany sense of humor as much as I did. The supporting characters were just as flamboyant as I’d expect from beings who work for a magical wish fulfilment company, but the creative, little details about their costumes and physical appearances that the author made sure to point out to the reader were what really endeared me to them. Imagining exactly what each one of them looked like was effortless. 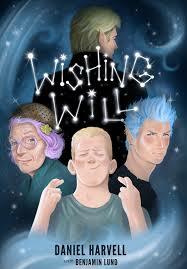 Whether you’re a kid or a kid-at-heart, Wishing Will is a good choice for anyone in the mood for something lighthearted.